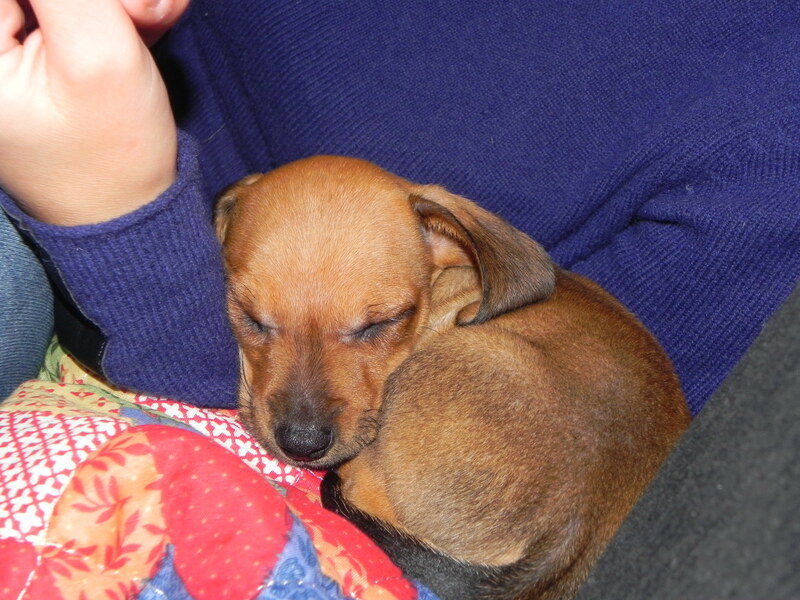 The youngest and smallest of 6 puppies born to a miniature pinscher mom and a dachshund dad in Marion, NY, I was adopted at 7 weeks by an awesome mom and dad and spent my first 2 months in Ithaca, NY. I’m now a world traveller living with my mom Sarah and my Aunt Amanda in Mwanza, Tanzania. Follow my adventures here! Tito, you are doggone adorable and I am following your travels in Africa ! Hands down the CUTEST puppy ever! I can’t believe people are scared of him over there…?! Thanks for stopping by my blog and liking my post. I absolutely LOVE Tito’s blog!! My boyfriend lived in Tanzania for a year when he was 7-8 while his dad (an anthropologist) completed a doctoral program. He has great memories of that time. I hope you don’t mind that I post her on your blog…. I’m searching for info about bring my dog to Kenya as we will be there for work for two years. My dog is a therapy dog with all the paperwork. I can’t fly into Nairobi with my dog in cabin, so I have to check him as cargo for 3,000 dollars!!! Hi. This is Valerie. I live in Arusha and 5 years ago brought a puppy from America to Tanzania on KLM. At that time, I was required to have the puppy seen by a veterinarian within a certain time period before leaving the States ( don’t remember if it was a week, 2 weeks, or longer). The Vet filled out a report on the health of the dog for me to take with me. Then we were required to have someone meet us at the airport in TZ with a permit to bring the dog into TZ. The vet here arranged that and it was cheap at the time, basically a formality. Where are you coming into? What city? Hi Rebecca, I don’t mind at all! We flew from Detroit to Amsterdam to Nairobi and back the same way with absolutely no problems on KLM. Tito was in the cabin with me the entire time. I am wondering if perhaps your flight into Nairobi is a codeshare with Kenya Airways, who is operating the flight, and maybe that’s why they won’t allow your dog in the cabin. I would call KLM again and ask because I’ve definitely not had any problems flying into Nairobi with KLM. I would highly recommend flying into Kenya rather than Tanzania because the Kenyans are much more ‘normal’ about dogs than the Tanzanians. If you do fly into Tanzania, I don’t have any experience with the Kilimanjaro airport, but I have flown into Dar es Salaam with my dog and no one at the airport seemed to know what they were doing so they didn’t even ask to see any paperwork and we just walked right out. It will probably be expensive to drive from Kilimanjaro to Nairobi. When we drove from Mwanza to Nairobi it was $500. She’s studying breastfeeding and parasite infections in infants. You can write me an e-mail if you’d like to know more! Hello Tito – We are your fellow tribesmen in Arusha Tanzania – 2 miniature dachshunds, mother and daughter. If you’re ever in Arusha again, welcome to visit us! We live on a small farm on Mt. Meru and have lots of places to explore. It would be fun! Hi Valerie! Thank you for you post! I am currently living in Portland Oregon and will be relocating to Nairobi Kenya April 15th. I was thinking about flying into Kilimanjaro Tanzania rather than into Nairobi because Kenya would make me fly my dog in Cargo. My dog is a Therapy dog and is cleared by the airline KLM to fly in cabin, but not into Kenya – because of their restrictions. KLM flight to Nairobi doesn’t allow live animals in cargo on this particular route…??? So my plan was to fly our dog into Kilimanjaro airport in Tanzania and drive to Nairobi, but it looks like I would have to have a host in country. I think I will have to begrudgingly leave my beloved dog with relatives until I can figure out if it’s a good idea to fly him there and if I can…. IN your opinion do you think it’s safe to bring your dog to live in Nairobi and do you think it’s safe to fly a pet into Kilimanjaro airport? I keep going back n forth on this – just wanting the best for my dog Leo. Hi Rebecca, I know it’s stressful, but don’t give up! I was stressing just like you about2 years ago when I was planning on bringing Tito to Tanzania. It’s funny because I chose to fly through Kenya and drive to Tanzania because there were definite rules about animal importation into Kenya and KLM most definitely allowed me to fly in the cabin with my dog in and out of Nairobi. We flew in the cabin for the first time in December 2011 and again in December 2012, so unless they’ve made changes fairly recently you should be able to bring your dog in the cabin. I also didn’t have to have a ‘host’ in Tanzania in order to bring him into the country via the Dar es Salaam airport. Definitely let me know if you have any other questions or if you would like me to put you in touch with any veterinarians in Tanzania, or any other dog-friendly places/people in Kenya or Tanzania! Good Luck! Hi, great blog! Thanks for writing about your adventures…so much fun and your dog is so darn cute! I had a quick question for you, if you don’t mind. We’re moving to Kenya and my dog is a 10 lb Boston Terrier. Flying him in cargo is a nightmare, I’m thinking of approaching KLM. If KLM lets us board in Canada, would you see a problem with arriving in Nairobi? Did they stop you and have you complete import papers or were you able to just leave upon arrival? We’ll have all of his rabies, microchip, vet cert., it’s just that the Kenyans want animals imported in cargo and not the cabin, which is really hard on dogs. So confusing! Any help is muuuuuch appreciated! Thanks! I definitely recommend flying with KLM. They were amazing each time I flew with Tito. We had no problem taking a KLM flight from Detroit to Amsterdam to Nairobi with Tito in the cabin. Before leaving, I contacted the Kenyan embassy in the US and paid ~$50 for an import permit, although when we landed in Nairobi no one asked to see it and they let us just walk right out. I’d get the permit just in case someone does decide they want to see paperwork. Also make sure you’ve got a record of all your dog’s vaccinations and have a veterinarian fill out an international travel certificate within a week of flying. Good luck and let me know if you have any other questions!